What Nail Biting Does To Your Teeth - Adelberg Montalvan Pediatric Dental PC & Orthodontics too! Nail biting is one of the most common habits people have. Most know it can mess up your fingers and nails, but what they don’t realize is that it can also damage your teeth. This article is about what actually happens to the teeth and gums when someone bites their nails over a long period of time and the potential damages it can cause. Your teeth can become chipped, cracked, or worn down from dulling the enamel. Enamel is the protective covering over your teeth that keeps the nerve unexposed. The more worn your enamel gets, you could have pain and sensitivity or potentially need more extensive procedures such as fillings, crowns, or dental surgery. For someone who wears braces, biting your nails can damage and shorten the roots of your teeth worse than someone who doesn’t wear them. Braces already put a lot of strain on the roots and nail biting will add even more strain to what’s already there. There are many things that could happen as a result of shortened roots, including: loose teeth, decay, headaches, pain in the face, and receding gums. Sore or damaged gums means nail biting went farther than the teeth. This could happen from jagged or sharp nails slicing the gums and unwanted bacteria from underneath the nails getting into your bloodstream through the minor injury. Very serious damage or medical problems can arise, and you might have a lot more to worry about besides just biting your nails. 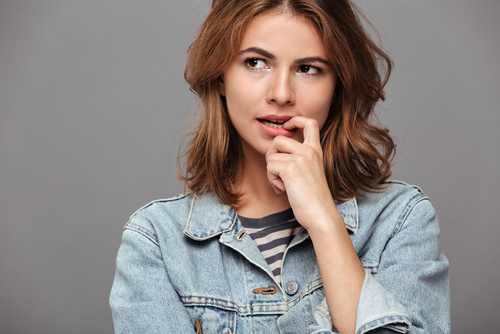 Here at Adelberg Montalvan Pediatric Dental, we strive to bring you the best in dental medicine, and we can help you learn different techniques to stop biting your nails. If you want to set up an appointment or learn more, give us a call!